It would seem the growing trend lately is bigger, better and faster. 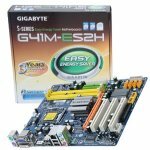 Sometimes bigger is not always better, as in the case of Gigabytes new GA-G41M- ES2h micro ATX motherboard. This board promises to pack a ton of features into the small 9.6″x9.6″ dimensions that make up the micro ATX standard. What may come as a surprise due to its small size and relatively low price range, is this board is designed for high end multimedia and mainstream gaming. Join me in giving this little board a full rundown to really see what its made of, and if Gigabyte can really pull off putting lots of features into a small price and smaller package.